WOW! I am going crazy, no fast internet means keeping up with this blog is hard. And we have done so much i can´t even write it all out! Will try and add more pics later, but have to pick up laundry (which hadnt been done in waaay too long- oh the luxuries of travelling) in half an hour, so not much time. Anyway, latest album skips out about 3 weeks of Argentina (Bariloche, the Navimag fjords ¨cruise¨ and of course like half the pics from Iguazu!) But will get to those sometime. Anyway, on our way to Bolivia we found ourselves with 2 bonus days in Argentina. Boca tango and Boca futbol... amazing. We went back for one last hurrah at the Recoletta market. It is so cool there. People are excited to talk about their work, they are friendly and things are pretty cheap. So have loaded up on jewelry, girls you will be thrilled! For the gents, have had a hard time finding gifts, but little woven string bracelets are abundant in Peru, so can pick up some of those if I cant find anything else suitable. Anyway, so after the market we headed back to rpimp for an actual night out. We got tickets for Boca Tango. Boca is a part of the city that i kind of rough, but has amzing colours. Kind of like Bermy, but made of tin instead of cement and primary colours instead of pastels. So maybe not so similar after all, but very cool nonetheless. We started with dinner, typical Argentinian parilla (which we have avoided as much as possilbe) some how rotating whole animals on an open grill has tunred me off meat a bit! hm?! Imagine that. So we got veggie lasagna an had a little cheeky vino. George (a friend we met in El Calafte) met up with us half way through dinner. Next was a comedy street performance. It left a little to the imagination as my spanish is really not that good and couldnt possibly translate. But it was pretty lively, so we got the gest of it. Then we moved inside to see the real action. The danicng was amazing. Although I think Pablo and I could teach those amatuers a few tricks. Ha And there was a live band and the lead musician was playing the accordian. He could jam. It was pretty cool, who would of thought the accordian?! We got a picture with him at the end. He was looked just like Nicola's Pop, well quite like him but also seemed to move like him, it was weird. So overall great night! The next day we wanted to go the the San Telmo antiques market. But had a major run around trying to find a cash point, so didn't have time in the end. Not that it mattered as I said the Recoletta market kind of cleared us out. But we managed to book a Boca football game. 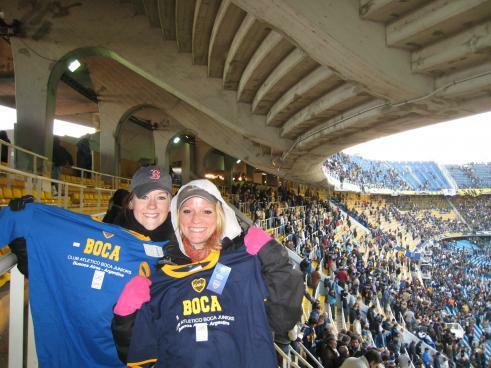 Boca is the most well known south american team and as I understand it its world famous too. Shows you my knowledge of football! But we knew enough to catch a game, so that is a start. It was freezing and of course we were sitting just two rows back form where the sun stopped. But the crowd kept us going. There is SO much energy in the stadium from start to finsih. The fans sing and chant and jump the entire game. It was really cool. Boca won 3 to 1 and I managed to get the third goal on video. So will put that up when I have time. We had a great, great time and was kind of sad to leave despite previous comments about not loving the city.